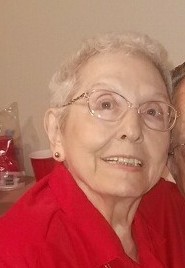 Virgie Louella Brown Dennis of St. Amant, La passed away February 9, 2019 at the age of 80. She is survived by her husband Joseph Leon Dennis of 59 years; Sisters, Evelyn Brown LeBourgeois and Betty Brown McCoy; brother, John Wilton Brown and wife Sandra Brown; sister-in-law Noemie LeBourgeois Millet and numerous nieces and nephews. She is preceded in death by her parents, Chester Joseph and Martha Lambert Millet Brown; brothers, Edgar Joseph “E.J.” and Alvin “Tootsie” Millet; sister, Beulah Babin. Brothers-in-law, Ellis LeBourgeois, Allen Jim McCoy, and Aubrey Babin; niece, Gaynell Andrews and nephews, Barry Millet, Brian LeBourgeois and Jason Brown. She was born in Whitehall, La. She is retired from Whitney National Bank. Her greatest joy in her life was spending time with family and friends. She loved LSU, the Saints and Mardi Gras. She would host a party for the Krewe of Diversion for St. Jude, this was one of her favorite charities. Services are being held at Holy Rosary Catholic Church in St. Amant, La. On February 13, 2019. Visitation will be from 10 until service at 12. Burial will follow at the church cemetery. In Lieu of flowers please send donations to St. Jude Krewe of Diversion, c/o Tori Siears, 42183 Hwy 941, Gonzales, La 70737. Please accept my condolences on the loss of your “Aunt Lou”. May the wonderful memories shared continue to provide comfort until the promises at Acts 24:15 are fulfilled.